A truely stunning example of this very highly regarded family diesel automatic saloon finished in unmarked white coachwork complemented with 10 spoke 17" alloy wheels.This car comes equipped with touchscreen satelite navigation,front and rear parking sensors , reverse camera,cd radio with usb and aux imputs,p/fold mirrors,bluetooth phone conectivity,cruise control/speed limiter,hill hold,led daytime running lights. auto light and wipers plus all the usual refinements,looks and drives superbly . Come to Rochdale Car Sales today and take advantage of our great deals available on used Hyundai i40 models for sale in Rochdale. Available as both a saloon and a tourer, the i40 is a sleekly styled model that's a joy to drive thanks to the premium interior, clever use of technology and responsive handling. 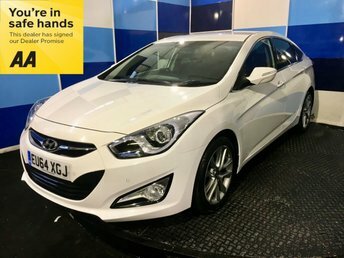 Come and take a closer look at the range of used Hyundai i40 models for sale in Rochdale by coming to Rochdale Car Sales today. You'll also find our complete stock of quality used cars listed here on the website. If you'd like more information on any of the models shown, don't hesitate to get in touch with a member of the showroom team.